Here's more code from the generous i/net vaults. It lets you write AIM chatbots in lisp, and is made available under the MIT license. lately I've been thinking it could be fun to add this as a backend for one of the CLIM IRC clients that people are working on these days. CLAIM is an implementation of AOL's semi-open Instant Messaging protocol, TOC (see PROTOCOL.txt). It allows one to build chatbots and other AIM clients. You must use the username and password of an existing AIM account (see <http://aim.aol.com/> on how to create a free AIM account). 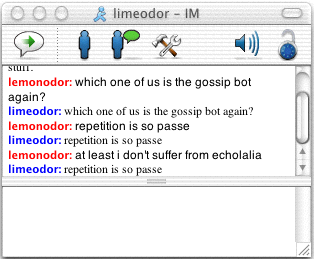 Anyone can now send messages to and interact with the gossip bot. CLAIM requires a lisp that supports the ACL socket API (see <http://www.franz.com/support/documentation/6.1/doc/socket.htm>, and <http://ww.telent.net/cliki/ACL-COMPAT>). Actually, all you need is a function socket:make-socket for connecting to a remote host (in text mode). The TOC protcol is slightly binary, mostly text. Accordingly, I open socket streams in text mode and fake the binary parts. It won't work unless your Lisp's code-char and char-code functions use ASCII. I've written the code without assuming multiprocessing, but in a way that will work with most multiprocessing implementations. Let me know if it doesn't work out that way. I checked all the other AIM libraries I could find, and nobody even tries to deal with the "server speed limit", which was a constant problem for me. See the comments at the end of this file for one attempt to solve this problem. This code has been tested in ACL/Linux, OpenMCL/OS X and MCL. At one point it was known to run on ACL/Windows and CMUCL/Linux as well. There should be much more documentation. I've tried to structure the code so that it is easy to extend and use for chat clients, but documenting what I did would help a lot too. Sorry. patched to use acl-compat, why does it hang after connect on CMUCL ? ?